Visual Studio>Tools>SSIS Basecamp connection for integration and migration of Basecamp data. 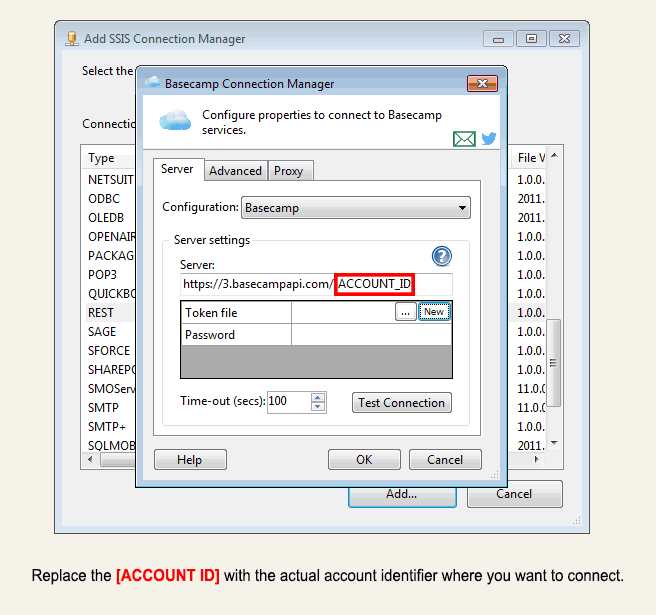 SSIS Basecamp connection for integration and migration of Basecamp data. SSIS Basecamp connection configuration for integration and migration of Basecamp data. COZYROC makes it easy to integrate or migrate data to and from Basecamp service. SSIS Basecamp connection configuration for integration and migration of Basecamp data. Introducing the COZYROC SSIS+ library with support for integration and migration of Basecamp service. Our Basecamp service configuration file, along with our REST adapters and connection manager, work in conjunction with SSIS to provide data integration capabilities for the Basecamp service. Available on the market since 2017, COZYROC makes it easy to integrate or migrate data to and from Basecamp service and will preserve the integrity of your data by always using the recommended API. You can use any application, service or database supported by SQL Server Integration Services (SSIS) or Cozyroc's toolkit as the source or destination for Basecamp data. REST Connection Manager - Stores the credentials and functionality for connecting to the Basecamp service. REST Source component - Retrieves data from the Basecamp service. REST Destination component Writes data to the Basecamp service.